Our product range includes a wide range of bulk type ultrasonic flow meter, insertion ultrasonic flow meter, ultrasonic flow meter and ultrasonic btu meter. We have now introduced a new Bulk type Ultrasonic Flow Meter Series. This meter operates on digital process technology with stable & permanent Piezo-Seal sensor. It is available with integral version of transmitter. Bulk type Ultrasonic Flow meter is a battery operated and transit–time Flow meter utilizing advanced digital processing technology. It is specifically designed where Electric supply is not available & accurate flow measurement is essential. Sizes Available from 2” to 20”. Maintenance free meter where no external power sources are available. Self-adjusting transducer receiving circuit continually adapts to changing pipe diameters due to scaling or corrosion. The meter contains No moving parts & does not require any external power supply. Fast response to flow transits. Unique housing design rated to IP 68. It works on Transit Time or Time of Flight principle. It utilizes two transducers that functions as both Ultrasonic transmitter and receiver. The transducer is inserted in the surface of the closed pipes. 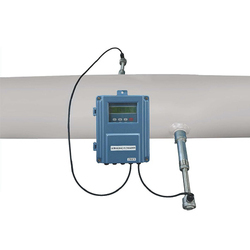 The transit time flow meter measures the time it takes for an ultrasonic signal transmitted from one transducer to cross the pipe and be received by second transducer. The flow is then measured by comparing the upstream and down stream time of Ultrasonic signal. With no flow through the pipe the transit time would be equal in both directions. 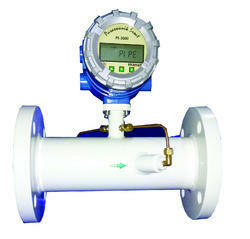 We have introduced Ultrasonic Flow Meter. Power Supply 85 V to 265 V AC, 50 Hz, Universal. Output 4-20 mA dc in max. 600 ohm load, Isolated, Proportional to Power. Manas have now introduced a new Clamp on type Ultrasonic BTU meter & insertion BTU meter. 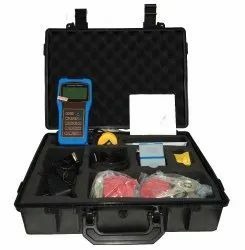 Clamp on type Ultrasonic BTU meter & Insertion BTU meter works on the transit Time or Time of Flight priciple. The flow meter unit utilizes two trasducers that function as both Ultrasonic transmitter and receiver. The transucers are either clamped on or inserted to the outside surface of the closed pipes. Looking for Ultrasonic Flow Meter ?